GSM has developed a very useful machine used for accelerated mixing of solutions in test tubes, small flasks or centrifugal tubes etc. The speed is regulated b a speed control device. It is a simple device used commonly in laboratories to mix small vials of liquid. 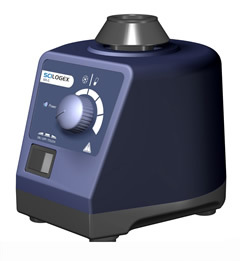 Vortex mixers are quite commonplace in bioscience laboratories. In cell culture and microbiology laboratories they may be used to suspend cells. In a biochemical or analytical laboratory they may be used to mix the reagents of an assay or to mix an experimental sample and a dilutant. In vortexing action Variable speed control allows slow speed shaking action up to high speed vortexing. In addition, each attachment is designed to produce different mixing actions, allowing users to choose the correct action for each application. It provides Multi-Task Versatility in which a broad range of attachments of various shapes, sizes, and materials allows for mixing of almost all common tubes or containers for Hands-Free or Touch operation. 1. Many years of proven performance in laboratories all over the world. 3. Short-time operation activated by pressing attachment (touch function). 4. Stable at high speeds thanks to special feet (silicon base with ultra high vibration damping). 5. Eccentric with ball bearings. 6. Suitable for continuous operation with low self heating thanks to self ventilation of motor.